Earlier in the week, the Washington Post reported that US Secretary of State Mike Pompeo will announce on Monday that countries importing Iranian oil will be told to stop or face US sanctions. A similar announcement was expected in September but the US balked and gave several countries waivers, allowing Iran to continue exporting 2 million barrels per day. That surprise was largely responsible for the collapse in crude in Q4. If the report is correct, the US will announce that all Iran exports as of May 2 will be subject to sanctions. Certainly some will still slip through to non-US-friendly countries but much of the remaining 1.25 million barrels per day of current exports will be cut. We're watching two things along with the headlines. 1) The WaPo report says Pompeo will simultaneously announce offsets to Iran exports from Saudi Arabia and the UAE. Neither has enough spare capacity to make up the shortfall but that could limit the headline risk. 2) How importers respond. India remains a heavy importer of Iranian crude and though they are unlikely to risk the wrath of US sanctions, they do have some leverage. 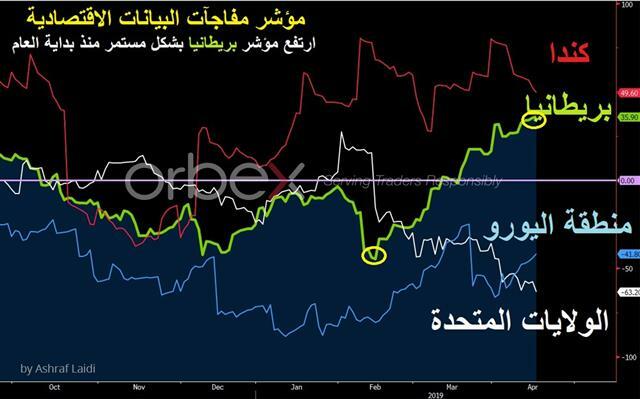 Saudi Arabic is careful to repeat last year's miscaculation when it hiked production to a record (exceeding 11 mln barrers per day) only to see Trump's backtracking off the sanctions lead to the intensification of oil's autumn plunge. $72.68 for Brent is the 61.8% retracement of the Q4 plunge. A break (and close) above that line would be a bullish development that could target as high as the Oct 2018 high of $86.74. At the same time, oil exporters such as CAD, NOK should benefit while the Turkish lira could face pressure as an importer that's already struggling with its current account balance and may be facing a run on FX reserves, according to an FT report on Wednesday that didn't get the traction it deserved. In the past six weeks markets have grown increasingly desensitized to soft news about a China-US trade deal. Presidential leaks and tweets about progress, optimism and good feelings about a deal once stimulated sentiment, now they have almost zero impact. True signs of progress are now falling flat as well. The WSJ reported Wednesday about plans for Lighthizer to fly to Beijing for talks later this month and counterpart Liu He to go to Washington a week later. They wrote that the aim is to get a deal signed in late May or early June. The report had almost no effect on markets. The conclusion can only be that a trade deal is 95% priced in or more. The risk then is that there is a 'sell-the-fact' trade in light of the already astounding run-up in stocks since the start of the year. We also remind that Trump's spat with China ramped up almost immediately after finishing NAFTA negotiations. Trump may pivot to Europe after a China deal and create a fresh impetus to de-risk. Canadian and US retail sales are due later today in what will be a sharp focus on the consumer globally. Beware of a drop off in liquidity and trading late in the day with most world markets heading out for the Good Friday holiday. Brexit has absolutely dominated headlines and trading in the pound for months but a possible respite in talks is an opportunity for the market to focus on the other part of the GBP-trade: The economy. UK unemployment held steady on Tuesday in what was largely a non-event for the pound. UK earnings growth at 3.5% y/y matched the high from 2008. Later in the day, negative comments from Corbyn about negotiations with May sent cable to the lows of the day at 1.3045. While Brexit headlines will continue to be market movers, we're likely stuck in a holding pattern in the big picture. That means their impact will ebb, flow and likely fade in the days and weeks ahead. Instead, the market will turn its attention to economic data. Today's UK CPI was described to have missed the target, but remains the best of both worlds: The highest CPI in the G7, but remains below the BoE's target. Thursday's retail sales report excluding auto fuel, sales are forecast to fall 0.3% after a 0.2% rise in February. Some Brexiters may say: "We told you UK economy would do well despite Brexit", a possible reply would be "Because hard Brexit has been avoided so far". Overall, UK GDP forecasts for this year have slipped to 1.2% from 1.5% at the start of the year but that's in-line with much of the developed world. Some of that is a result of Brexit uncertainty, which has diminished after spiking in March. 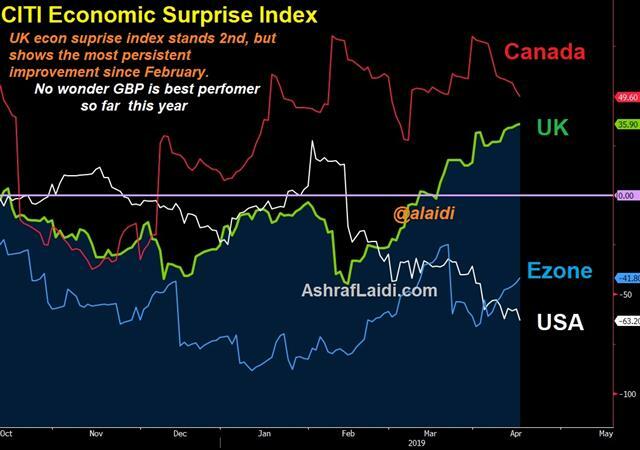 The Citi Economic Surprise index at +36 is one of the better global readings so there have been some beats, albeit against very low expectations. Given the negativity in GBP and the uncertainty, risks are skewed towards the upside but none of that can materialize until the data starts to show a growth pickup.